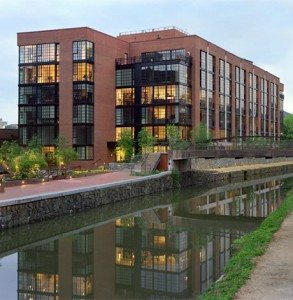 Today I toured a 5-Unit Open House at one of my favorite DC buildings, 3303 Water Street, NW in Georgetown. This stunningly modern East Banc development is definitively the red hot property in what can otherwise be a lack luster DC condo market. The building’s two recent high dollar sales have resulted in over $1,500 per square foot trophies for their owners placing 3303 Water Street at the height of the price per square foot roster in the City. Well done. Unit L-7, an expansive 3,000 feet of living space, closed at $4.550M while it’s king sized counterpart F-8 at over 4,000 square feet fetched a whopping $6.250M. Both units closed on Halloween day. No tricks but a lot of treat! The five open houses ranged from 1,000 square foot 1-bedroom units ranging from $900,000 to $1.2M to three 2-bedroom den units all duking it out in the $2M – $2.5M range. My favorite was unit 3-H which offered a duplex floor plan which flowed out into a sizable private walled garden. It seemed the best value at $2.475 with the bedrooms and office on a separate floor from the main living space and the addition of an “outdoor room” which can be hard to find in the City. All of the units had Water Street’s characteristic black block windows, stunning Euro kitchens and sleek Carrara marble baths. High ceilings, hardwood floors and modern furniture were in abundant supply and rightfully so. That’s clearly the building’s vibe and most owners really run with it to great effect. It truly was a glorious fall evening in DC and I took a moment to steal away to the building’s incredible roof deck where I watched the sun set behind the Virginia skyline. The Potomac was alive with boaters as the Kennedy Center’s lights came aglow. I thought about how nice it would be to trade in my 3 flights of steps and old windows for this kind of living. I guess I’ll just have to wait til unit F-8 comes for sale again. Are you interested in living Life At The Top? 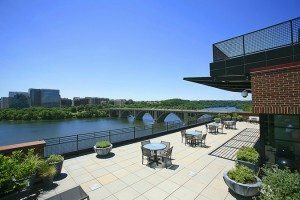 Request a tour of one of DC’s best condo buildings now!